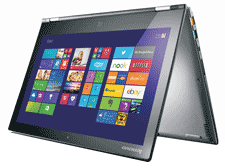 Lenovo Yoga 2 Pro 13.3" QHD+ 4K Laptop Core i7 Intel-4510U 8GB RAM 256GB SSD. Lenovo brings you a splendid more attractive device for all the laptop and tablet lovers. An excellent medium for you to have fun and productivity of both laptop and tablet. With you mood and style match the utility of the device with Lenovo yoga 2 in addition to this flexibility utility it gives you a superb bundle offer to have the maximum out of your device. This superb device is a fully functioning tablet and a laptop with all its features intact. It gives you the variable utility making it a fun and exciting device to be used in various dimensions. You can use it like a traditional laptop and have all the productivity going with comfortable working angle. You can fold it all along the full angle making it a full fledge tablet and make you have all the fun. You can make it in the array of tent making it stand in a tent like position and you can watch movies all day long with such a comfortable position. You can also make it in a stand in a specific angle so that to give an ergonomically typing position in tablet form. The screen is featured with 10 point touch sensitive panels that gives the multi-touch property and allows the users with maximum and quicker usage of your device. Drag, draw, select, type, multi touch facility gives enhancement in all. 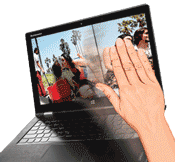 The screen Lenovo gives is 2 13.3-inch is only 15.5mm at its thickest packed with 4th generation inter core processor. This much thin and slim design make it portable in all modes. The keyboard is accu type keyboard that gives finger friendly array that allows maximum usage of the keyboard. Lenovo gives you another superb feature of enhanced productivity and control. With features like voice control and motion sensors you can control the device through voice signals. And motion sensor gives you the sliding feature for presentations images etc. This epic device is equipped with built in devices for perfect video conferencing experience. With built in Dolby speakers and a superb webcam gives a complete edge. Speakers that gives amplified sound quality and web cam that can support and can be connected to big screen TV for more excitement. This device comes with the bundle pack of Bull Guard antivirus pack and a Skull Candy headphone (included with the device).